paul gregutt's washington wine blog – unfined & unfiltered: why can’t we all just get along? I thought his point was well taken. If samples are requested and sent, it seems both rude and disrespectful not to respond with a brief reply. Now, that said, it’s different for a wine reviewer, and here is why. First of all, I do not request specific samples with the goal of representing and/or selling the wines. Secondly, many of the wines that are sent to me will never be reviewed ¬– there are limits on my personal time and space. Third, if I were to offer private commentary to one winery, I would have to offer it to all, an impossible task. PG: I do not make, buy, import, or distribute wine, so this discussion is a bit of a peek behind the curtain. But I sense a growing rift between those who are making wine, and those who control the access to the consumer – wholesalers and retailers. Both sides are facing challenging times. Whose burden is the harder? Whichever side of the line you fall on, I think it is a disservice to this industry, and the many people who have built it, not to make courtesy a priority. Winemakers understandably get frustrated banging their heads against so many walls. Distributors and retailers get swamped with samples from (sometimes) desperate sellers. These are not easy times for anyone. 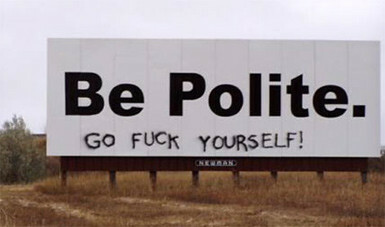 But politeness is always the better choice in any personal relationship. I would be sorry to see the camaraderie and fellowship that traditionally infuse wine business relations fall victim to the dog-eat-dog marketplace we are currently experiencing. I hear all the time from my politest distributors that they receive many,many samples from wineries desperate for distribution. From Gramercy's comments, it appears the samples were unsolicited. That said, it is tough and your comments are appreciated. We hear there are fewer and fewer distributors in many markets. I know, personally, many newer wineries with decent product at good prices that can't get distributors to even listen to them. They are additionally hampered by the archaic liquor laws of the states that make up our country. I particularly enjoy the tension (usually unspoken) between wineries and distributors. The distributors, of course, belong to associations that lobby legislatures to prevent, hamper or slow down direct shipping to consumers. I had a long talk one day with a distributor that wanted me to stop offering a wine for sale by the case at 10x retail (12 for the price of 10). This was a distributor buying a wine from me for $90, selling it for $138, complaining about me selling it for $150 direct. I told her if I didn't sell some of the wine for $150 a case, I would not make said wine because it would be stupid to risk so much money for such little return - in other words, we'd have nothing to talk about because there would be no wine! it's obvious that the sentiment "since we are making wine, we will obviously sell that wine" is done. and distributors, apparently, know this. there is a lot of wine out there, a ton of brands, and a big question of wine homogeneity in the industry, particularly in areas that have shown extraordinary growth in such a small time, or in areas where more and more people are "squeezing in." i agree, there is an amount of courtesy and politeness that would behoove distributors to apply to anyone sending samples, requested or not: they never know which wine maker out there will be the next star. But the industry has created the prescribed grooves the wheels of today's wine must follow: it must be from this vineyard, this winemaker, this amount of alcohol, this crazy label, etc. ; again, something distributors know, so they focus on what they know, what sells. the idea that you suggest, that distributors are the only entity that controls access to consumers will become, hopefully, a relic of the 20th century. any wine maker has the opportunity to step out, make a connection to an audience, and if it is genuine, and their wine truly individual, they will, in time, find their drinker, on a much more personalized level than ever before. Gramercy's juice is so good I would be a bit miffed if it didn't get a reply either! Looking at Greg's post, it sounded like they requested the samples, so it is rude that no reply was given. Rude, not to mention foolish on their part given Greg's reputation and scores from out of the gate. I am sure this distributor in 2 or 3 years (if they are in business) will regret their decision. I find myself working harder than ever to sell wine, using social networking, wine club, tasting room, special events, winemakers dinners, and of course expanding my wholesale distribution which includes about 10 states now. This diversification allows us to stay stable in unstable times. Distributors are just merely a part of the puzzle.